Bowser is a mutt with a sketchy past, and after a rough life in the city, he's locked up in a pound in a small town in Louisiana. But he finally gets his lucky day--eleven-year-old Birdie Gaux comes in with her Grammy to get her late birthday present--a dog. It's also Birdie and Grammy's lucky day, though right now only Birdie thinks so. Bowser smells trouble here in the swamp, and he's determined to protect his new buddy, Birdie. Birdie's mamma is working on an oil rig off the coast of Africa. Her dad, a police officer, was killed in the line of duty years ago, and she has only a few memories of him. Grammy, her father's mom, runs a a local fish and bait shop. When they return to the shop after adopting Bowser, they find Grammy's shop assistant, Snoozy, snoozing, and Grammy's stuffed and mounted prize marlin missing. The sheriff comes, but he doesn't seem to take the matter seriously; the missing fish is "only" worth $300, so it's petty theft. He also says he doesn't smell the tobacco that Birdie (and Bowser, of course) can clearly smell. Bowser tells us the story as Birdie starts her own investigation, and in the process learns some unexpected family secrets. 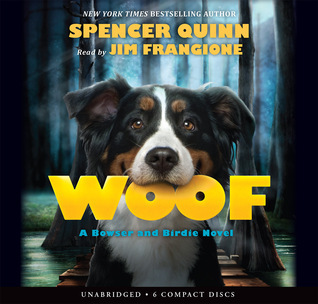 Quinn is just great at convey a pretty believable dog's-eye view of the world Bowser cheerfully relates everything he sees, hears, and most of all smells--to the reader. He can't tell Birdie, because he doesn't speak English. And he totally misinterprets some of what he sees and hears from humans because, of course, he's a dog, and only understands just so much--and his past life experience is with a city street gang.